A stand-alone update to VMware vSphere 6.7 sports a few upgrades and a polished HTML5 client interface, while another version bundles the company's AppDefense security product with a higher price tag. Besides the new interface, vSphere 6.7 Update 1 contains a vCenter Server Converge Tool and additional vMotion and snapshot capabilities for Nvidia Grid vGPUs and support for field-programmable gate arrays (FPGAs). Experts said these additional vSphere capabilities are useful, if not long overdue, but don't elevate this release to a major one for vSphere customers. "There are some nice things, like the vSphere Client, and the FPGA support for vMotion is good for people that will use the product every day ... but it is a minor upgrade," said Gary Chen, research manager for software-defined compute at IDC. Some of the higher-end technical improvements could attract some users who implement machine learning and AI capabilities, Chen said. However, the virtualization market is very well-penetrated, and the new release is more to evolve the product and keep customers on board. Most end users will welcome the vSphere update's tweaks to improve the HTML5 client, as well as vGPU vMotion additions, but those particular functions won't drive greater adoption of the product, said Brian Kirsch, IT architect and instructor at Milwaukee Area Technical College. The bundled version, vSphere Platinum Edition, contains vSphere 6.7 Update 1 and AppDefense, with a vCenter plug-in for AppDefense, and it offers application-level security, according to Mike Adams, senior director of product marketing for VMware's cloud platform business unit. "AppDefense can offer a good known state for what should be running in the hypervisor from the applications' perspective," Adams said. "So, if there is any deviation from that, admins will get an alert right away and be able to do something about it." Most IT shops will appreciate VMware's continued focus on security with the bundling of AppDefense, Kirsch said. This, combined with NSX's attention to east-west attacks, should curry favor with larger IT shops. Why would you [buy] the bundle if you can buy [vSphere and AppDefense] cheaper separately? What could steal attention away from the products' new features, however, is the Platinum Edition's price tag of $4,195 per CPU, per year. The current edition of vSphere Enterprise Plus goes for $3,495 per CPU, per year, and the current SaaS version of AppDefense is $500 per CPU, per year, totaling $3,995. Asked to explain the higher Platinum price tag, Adams noted the package includes $10,000 in promotional credits for VMware Cloud on AWS. He added that this, plus the AppDefense vCenter plug-in, "is of significant value" to users. The additional $200 per CPU, per year, is a significant sum for some large IT shops that have hundreds of servers, each with four, eight or more CPUs. Many might opt to buy the products separately and pocket the savings. "Why would you [buy] the bundle if you can buy them cheaper separately, unless they are not telling us something?" IDC's Chen said. The promotional credits for VMware Cloud on AWS may offer some incentive, but workloads that require the aforementioned horsepower in AWS will use that up relatively quickly. Buyers also should be aware that the credits are good for only six months and can be used only toward single-server instances, Chen said. With DaaS, desktop operating systems run inside virtual machines on servers in a cloud provider's data center. All the necessary support infrastructure, including storage and network resources, also lives in the cloud. As with on-premises VDI, a DaaS provider streams virtual desktops over a network to a customer's endpoint devices, where end users may access them through client software or a web browser. How does desktop as a service work? DaaS architecture is multi-tenant, and organizations purchase the service through a subscription model -- typically based on the number of virtual desktop instances used per month. In the desktop-as-a-service delivery model, the cloud computing provider manages the back-end responsibilities of data storage, backup, security and upgrades. While the provider handles all the back-end infrastructure costs and maintenance, customers usually manage their own virtual desktop images, applications and security, unless those desktop management services are part of the subscription. Typically, an end user's personal data is copied to and from their virtual desktop during logon and logoff, and access to the desktop is device-, location- and network-independent. Desktop as a service provides all the advantages of virtual desktop infrastructure, including remote worker support, improved security and ease of desktop management. Further, DaaS aims to provide additional cost benefits. 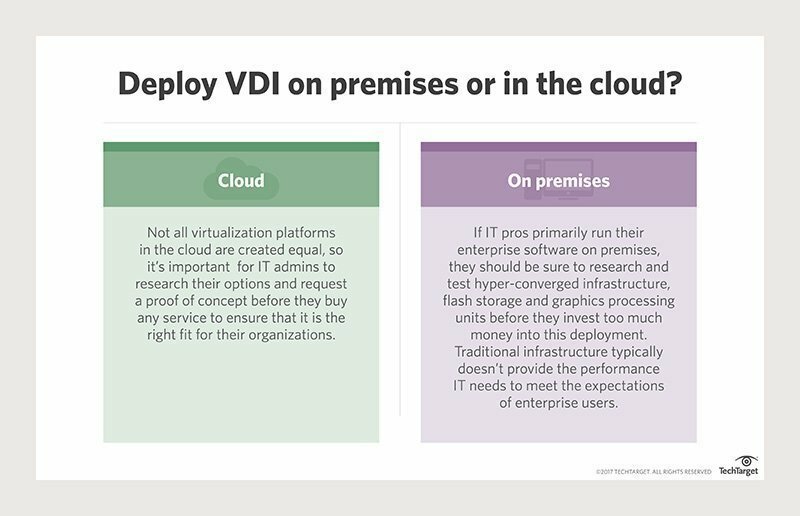 Deploying VDI in-house requires a significant upfront investment in compute, storage and network infrastructure. Those costs have decreased, however, thanks to the emergence of converged and hyper-converged infrastructure systems purpose-built for VDI. With DaaS, on the other hand, organizations pay no upfront costs. They only pay for the virtual desktops they use each month. Over time, however, these subscription costs can add up and eventually be higher than the capital expenses of deploying on-premises VDI. Additionally, some advanced virtual desktop management capabilities may not be available for certain DaaS deployments, depending on the provider. Two leading virtual desktop infrastructure vendors, Citrix and VMware, also provide desktop-as-a-service offerings. Another major DaaS provider is Amazon Web Services, whose offering is called WorkSpaces. There are also a variety of cloud computing providers that host and manage Citrix and VMware virtual desktops through those vendors' partner programs. What roadblocks are preventing DaaS from becoming the most common delivery model? Earlier last week, IBM launched IBM Cloud Private, which enables enterprises to bring modern development technologies such as containers, microservices and APIs -- all attributes of public cloudenvironments -- to private clouds in the data center, where IBM has tenure as a leading technology provider. VMware plans to acquire SD-WAN vendor VeloCloud Networks, a move that would turn the branch office into a battleground for the virtualization provider and Cisco. There are a bevy of virtualization monitoring and management tools on the market, and your IT shop’s success hinges on finding the right one. Virtualization monitoring and management tools are critical to a successful server consolidation project. If you drive hardware utilization rates up too far, you can end up with poor virtualization performance for end users. Since the last thing you want is user complaints, you’ll have to closely monitor performance as you add more and more virtual machines (VMs). All virtualization monitoring and management tools have varying capabilities. Some measure performance in real time, while others provide historical data. Certain tools provide statistical analysis of data to eliminate false positives and can help with monitoring and troubleshooting performance problems. Capacity planning and analysis and chargeback of virtual infrastructure resources are other abilities to look for in performance monitoring tools. Quest Software Inc.’s vFoglight (formerly Vizioncore vFoglight) is one of the few multiplatform performance measuring tools and can monitor both VMware Inc. vSphere and Microsoft Hyper-V. VFoglight has one of the prettiest interfaces, but it may require a significant amount of resources to run (see Figure 1). The red/yellow/green indicators on the dashboard are useful, as are the visually appealing graphs and dials showing performance status. 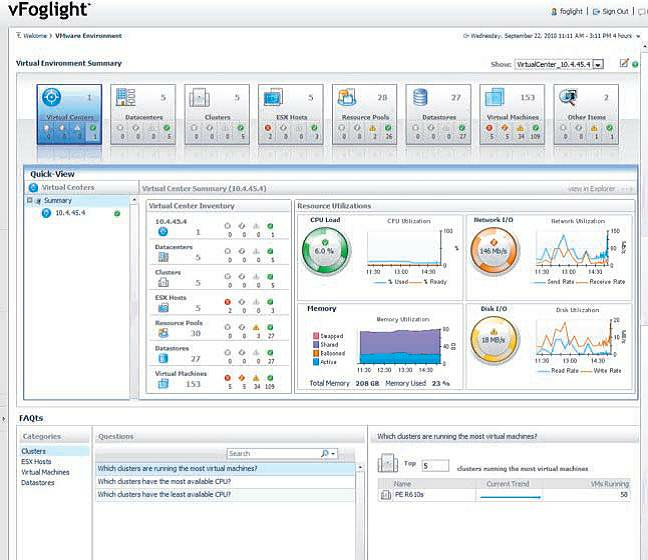 VFoglight records information on guest processes as well as “alerts with expert advice.” This product has detailed architectural representations, models workload migration, and it helps manage resource usage and multiple virtual data centers. Veeam Monitor from Veeam Software is part of the larger Veeam One suite. Monitor installs as a traditional Windows application, and you can use the included SQL Express local database or connect it to your own database. The monitoring and management tool integrates with the free Veeam Business View to show the virtual infrastructure how your company is organized. Monitor offers good views of “top talkers” in each of the different resource areas: CPU, memory, storage and network (see Figure 2). The product has more than 125 performance alerts, and it can correlate vSphere performance information with vSphere events, which is beneficial for troubleshooting. The free version of Veeam Monitor has some limitations, such as providing only seven days of history. Veeam Monitor Plus comes with capacity planning, change management and reporting/chargeback capabilities. The commercial version of Veeam Monitor is agentless and includes custom alarms. It also enables management of guest, host and vCenter processes. VKernel Corp. was the first company to feature virtualization capacity analysis. Its vOPS tool deploys as a virtual appliance, so there is no OS license or traditional app/database installs to perform. The VKernel vOperations Suite (see Figure 3) includes the Performance Analyzer, Capacity Manager, Optimizer, Reporting and Chargeback components. It is also available as a vCenter plug-in or a Web-based interface and integrates with Active Directory. The components are simply unlocked with license keys, and just one appliance is needed for all affected products. 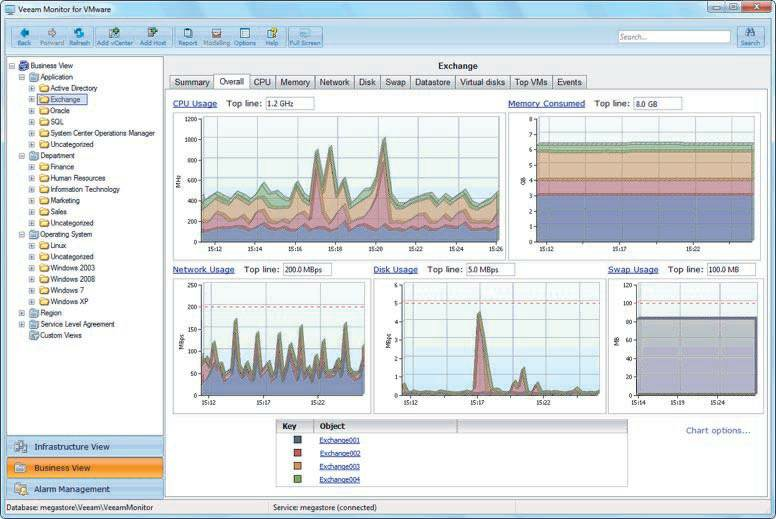 A relatively new entry in the market is VMTurbo Inc.’s Virtualization Management Suite (VMS). VMS is a virtual appliance that provides basic virtual infrastructuremonitoring at no cost. Additional modules (licensed individually)include Reporter, Planner and Optimizer, as well as the free Monitor piece. All ofVMTurbo’s virtualization monitoring and management products are installed in a single virtual appliance. The Reporter module focuses on performance reporting and capacity reporting, not necessarily inventory reporting like Veeam Reporter. Planner deals with what-if scenarios and is a capacity planning tool rather than a physical-to-virtual (P2V) planning tool (see Figure 4). Optimizer aids in resource optimization and bottleneck identification. 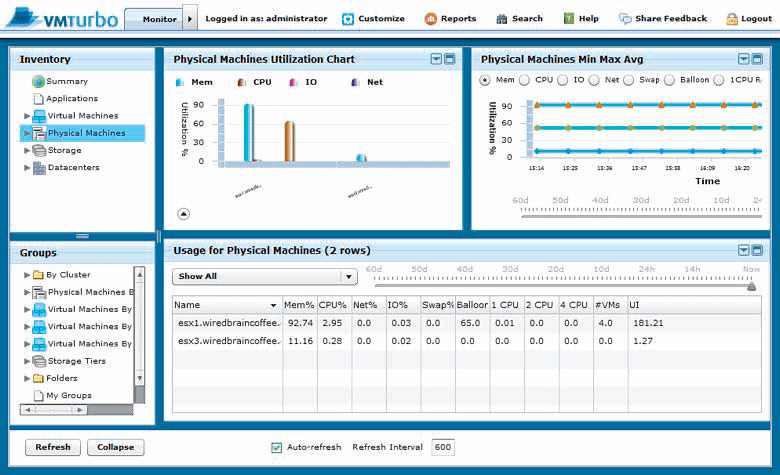 Xangati’s virtualization monitoring and management tools tool also deploys as a virtual appliance. A free version of Xangati for VMware’s ESX hypervisor is limited to monitoring a single ESX host. It gives insight into the virtual network thanks to NetFlow monitoring. This tells you who is talking to whom and what types of protocols they are using. A DVR-like rewind replay allows admins to revert to a previous point in time to identify a problem. It triggers a recording of virtual infrastructure performance utilization from vCenter alarms. In addition, Xangati recently released dashboards that give health scores to virtual infrastructure objects. These scores are based on historical statistics and provide guidance on normal and abnormal behavior in the infrastructure. The tool has continuous, real-time visibility into more than 100 metrics on an ESX/ESXi host and its VM activity, including CPU, communications, memory, and disk and storage latency (see Figure 5). The commercial version has a management dashboard for multiple hosts and virtual desktop infrastructure (VDI) functionality. Xangati is useful for troubleshooting the virtual network, and it would be beneficial if other performance tools integrated NetFlow statistics. Zenoss Inc.’s products are based on open source software. Zenoss Community Edition is free, but if you don’t have Linux experience, it may be difficult to deploy (see Figure 6). A downloadable virtual machine is designed for VMware Player, so you may have difficulty deploying it to vSphere. Zenoss offers configuration management database (CMDB) support, inventory and change tracking, performance monitoring, log monitoring, and alerting. The Community Edition isn’t as strong for capacity analysis and finding waste as some of the more dedicated tools—but then, it is free. 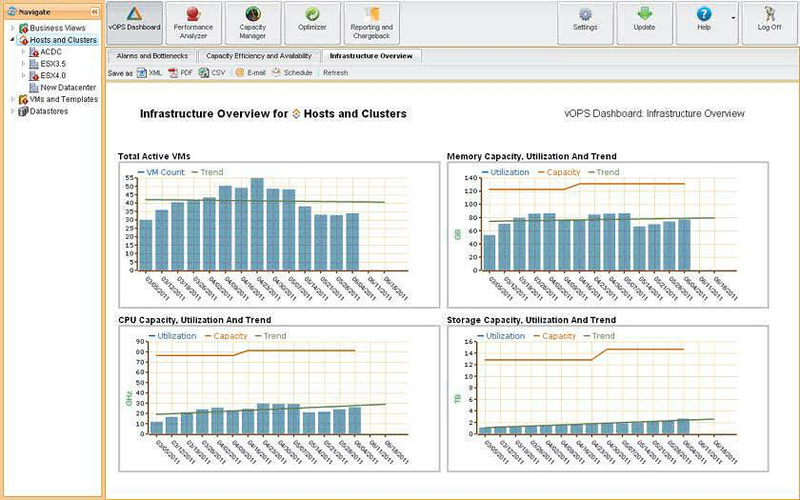 VMware Inc.’s two primary performance monitoring tools are vCenter Operations and Capacity IQ. In August 2010, the company acquired Integrien and absorbed Alive into its product line. That product later became vCenter Operations and takes a statistical anomaly approach to identifying performance problems. It learns what is “normal” in your virtual infrastructure and provides numerical scores for how hosts and virtual machines deviate from that statistical norm. VMware’s other primary performance monitoring and management application is VMware vCenter Capacity IQ, which focuses on—you guessed it—capacity of the virtual infrastructure. It is deployed as a virtual machine and is used to identify overallocated virtual machines, automate capacity monitoring and management tasks and identify capacity bottlenecks. Capacity IQ can also perform what-if capacity analysis. Depending on your enterprise needs, you may need insight into VMware vSphere statistics through what is already reported in VMware’s vCenter or knowledge of the virtual infrastructure’s network and storage through alternate sources. Decide which functions are most important for your data center. Not all virtualization monitoring and management tools are created equal. Some are intended for general performance monitoring and alerts, while others offer very specific capacity analysis or troubleshooting capabilities. Performance tools may be bundled with other products such as change management or reporting applications. Veeam Monitor and Quest vFoglight are solid examples of traditional, virtual infrastructure performance tools. But lesser-known performance tools such as Xangati, VKernel, SolarWinds and VMTurbo offer unique features. Make sure you look at third-party vendors before you select a tool. Some IT shops may have concerns about virtual appliances for security reasons, but you may love the ease of deploying virtual appliances over installing traditional Windows apps. Evaluate performance monitoring and management tools like these in your own environment to ensure that they give you not only immediate but also long-term value. Smaller environments may be able to make do with native hypervisor features, but for true scalability, you'll need dedicated virtualization management tools. VM monitoring tools should be an important part of any virtual data center. In some cases, organizations may be reluctant to invest in such tools because they do not see the cost benefit. After all, any hypervisor includes native tools, and the organization may already have tools in place for monitoring physical servers. Even so, VM monitoring software provide capabilities that go beyond those of monitoring tools designed for physical servers or native tools included with a hypervisor. Major hypervisor vendors, such as Microsoft and VMware, offer their own hypervisor management and monitoring tools. Microsoft's product is System Center Virtual Machine Manager (SCVMM). VMware offers vCenter, as well as a variety of options under its vRealize Suite. There are also third-party tools available, such as VMTurbo, and vCommander from Embotics. Each product has its own unique feature set and capabilities, but there are some relatively common capabilities which administrators typically look for in VM monitoring tools. These capabilities usually provide specific value for virtualization environments, and are beyond the scope of a product designed for monitoring physical servers. This raises the question of what benefits virtualization-specific monitoring software provides that monitoring software intended for use in the physical world does not. One such example might be automated VM deployment. In all fairness, there are many products able to perform bare-metal provisioning for physical servers, and many can even deploy an operating system to a VM. However, a product designed for physical servers would presumably lack the ability to create a VM. As such, an administrator would have to manually create the VM and configure its hardware allocations before using a tool to deploy the operating system. Conversely, a virtualization specific tool such as vCenter or SCVMM can be used to automate the entire VM creation and operating system deployment process. 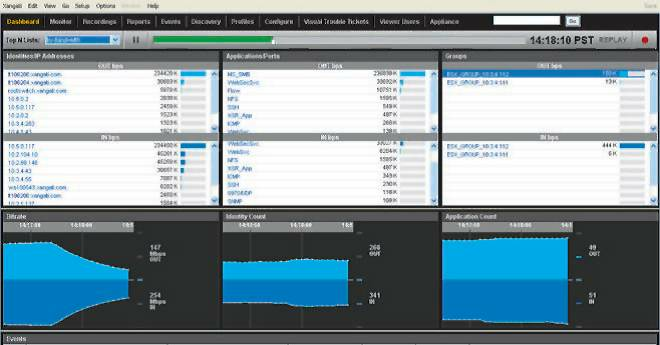 Another capability that a hypervisor-level monitoring tool might provide that tools designed for physical servers do not, is dynamic workload optimization. VM monitoring software can monitor each virtualization host's utilization, and dynamically move workloads among hosts on an as-needed basis in an effort to balance the workload. Although tools designed for the physical world might offer workload monitoring as a part of a capacity planning feature, there would be no feature that would allow workloads to be dynamically moved among physical machines because the physical world has no concept of VM portability. Although virtualization specific management and monitoring tools offer additional capabilities, it is also worth considering what functionality such tools might provide beyond what is available in the tools that are natively included with the hypervisor. Once again, the feature set varies from one vendor to the next, but one of the biggest advantages to adopting dedicated VM monitoring tools is that these tools generally provide better scalability than native tools. Consider the tools Microsoft provides for Hyper-V. Hyper-V includes the Hyper-V Manager, which allows for basic VM creation, monitoring and management. However, the Hyper-V Manager deals with VMs on a per-host basis. This means administrators must make the tool aware of each Hyper-V host. Furthermore, the Hyper-V Manager does not provide a unified view of the organization's VMs. In contrast, Microsoft SCVMM allows administrators to define host servers, host groups, host clusters and even private clouds. The tool can also display all of the organization's VMs collectively, regardless of which server they reside on. In other words, the SCVMM provides much better management scalability than what can be achieved by using the Hyper-V Manager. Of course scalability isn't the only feature SCVMM offers beyond the Hyper-V Manager's capabilities. SCVMM includes template-based VM deployments, abstracted storage management and the ability to define maintenance schedules, among others. Keep in mind that I am only using SCVMM as an example. VMware's vCenter offers numerous capabilities that do not exist in VMware's native management interface. Although it is possible to operate a virtualized environment without dedicated VM monitoring software, such tools allow you to use your virtualization infrastructure to its full potential. VM monitoring tools provide capabilities which simply cannot be achieved using native hypervisor tools or management tools that are designed for the physical world. Cross-Cloud Architecture, VMware's latest attempt at a comprehensive multicloud offering, is largely focused on VMs, which could cause problems going forward. The dust has settled from VMworld US for another year. What did we get for new products and features? There was no new version of vSphere or any of the other core VMware products. Instead, we got bundles and architecture. The Cloud Foundation bundle is basically vSphere with virtual SAN for storage and NSX for networking. This comes as no surprise, as these are the products that VMware has stated will bring revenue growth, so they need to be easier to sell. At least VMware didn't choose a horrible name for the bundle this time -- the new architecture is called VMware Cross-Cloud Architecture. I hope that VMware is starting down the long road to a real hybrid cloud approach, though I fear that this is another attempt to make hybrid cloud an all VMware offering. Businesses that I talk to have wanted a workload broker for many years. They want to be able to offer business units the ability to deploy applications on a range of platforms, both on premises and in the cloud. A complete cross-cloud architecture needs to allow VMware customers to get full value out of each cloud platform. Businesses want to get the agility of a public cloud deployment for some applications. These same businesses want to have tight control over applications that contain critical data. The hardest part is that they want the full value of each platform, not the lowest common denominator service offering that works the same on every platform. Most businesses that choose to put workloads in Amazon Web Services (AWS) are not doing so because they can get a virtual machine for 10 cents per hour. Most workloads in AWS are engineered and developed specifically for the AWS platform. The same is true for workloads on the Google Compute Platform (GCP). Deployed application architectures are different on these public clouds. Ironically, cloud deployments are very similar to on-premises deployments in Azure. Those adopting Azure are more likely to migrate their existing on-premises workloads into Azure because they can migrate without making major architectural changes. VMware has seen the same behavior for the relatively small number of clients that moved to vCloud Air. Both Azure and vCloud are well-suited to lift and shift migrations, where on-premises VMs are migrated into the cloud. Based on VMware's history, a hybrid cloud is all about where to place your VMs. But that is not how public cloud has been valuable to AWS and GCP customers. What I don't like about VMware's Cross-Cloud Architecture is that it seems to be focused solely on VMs. This is natural for VMware, as they have had great success with VMs in enterprise data centers. When all you have is a hypervisor, every problem is solved by more VMs. The Cross-Cloud Architecture makes it easy to deploy some of those VMs on AWS, or other cloud platforms. That's great, but it's just the beginning. A complete cross-cloud architecture needs to allow VMware customers to get full value out of each cloud platform. Making a broker expose the uniqueness of each cloud is no simple task. Cloud platforms are highly differentiated and services are not directly comparable. The simplest example is that you can run Microsoft SQL Server in many ways, including on premises, as a service on Azure and as a service on AWS. Each platform has a different way to manage database performance and colocation of multiple databases. Each cloud platform might have options for other kinds of databases; for example, AWS has nearly a dozen database options in its own services. Then databases can be run inside VMs on any platform that lets you run a VM. A more complicated example is a network load balancer. For on-premises deployment, you can have physical or virtual appliances. Alternatively, you might use network virtualization like VMware NSX. In the cloud, you might use the virtual options, or you might use the cloud platform's own load balancer. To get the most value from a hybrid cloud deployment, you need to choose the appropriate deployment for each platform. So far, Cross-Cloud Architecture seems to treat the non-vSphere platforms as if they are vSphere platforms. Basically, it becomes another place you might run your VMs. As a start, this is okay -- being able to choose from a range of locations when I deploy a VM is good. It's what we expected when VMware acquired DynamicOps back in 2012. The acquisition has resulted in the vRealize Automation (vRA) product. VRA is the heart of the Cross-Cloud Architecture. But VMs are not the answer to every problem. Businesses want to use the services of each cloud, and VMware needs to extend the Cross-Cloud Architecture to cover the services that each cloud platform offers. I expect that we will see this when VMware has a cloud platform that offers application services. For me, the real question is when VMware will start to offer these services. Maybe Cross-Cloud Architecture is really only marketing aimed at reducing the perceived value of competing cloud offerings. If every cloud is just a place to run your VMs, then the VMware cloud is a great option. Why should IT professionals embrace the cloud? Small and medium-sized manufacturers pursue cloud ERP software for lower costs, easier maintenance and greater flexibility. Learn how some SMBs have benefited by moving to the cloud. When it comes to ERP systems today, it can be easy to forget that some companies -- even small and medium-sized businesses (SMB) -- still install them on premises. But there is no doubt: Cloud ERP software is taking the world by storm. SMB manufacturers, like their larger counterparts, are increasingly taken with cloud offerings. Organizations today are shouldered with an embarrassment of riches: too many software systems. How to best deal with the dilemma? Consolidation. But the integration challenges are not few in number. Traditional enterprise software vendors have cloud-based ERP products targeted at the SMB space, while pure-play cloud vendors and even open source cloud providers are gaining traction. The whole world of ERP seems to have gone cloud. "Certainly for new implementations, a lot more organizations are looking for cloud solutions," said Nick Castellina, research director of business planning and execution at Aberdeen Group. "SMBs don't have the money for upfront capital expenditure. And they don't want to focus on owning a large ERP implementation. They want to focus on what they do best: making goods and selling them." Of course, there are still situations where a midsize manufacturer might prefer to install and run its ERP software on site. "Cloud is not a one-size-fits-all solution," said Katharine Rudd, managing director at Alsbridge, a global consulting company. "For more complex customized deployments, on-premises or hosted solutions will be a better fit." On the other hand, many consultants, including Castellina, recommend that companies reduce the amount of ERP customization to a minimum to keep a handle on complexity. Not so long ago, it was common to hear managers say they could not use cloud ERP software because of reliability and security concerns. Those concerns have largely been put to bed. The fact is a cloud ERP vendor has far more resources to devote to uptime (backed up by service level agreements) and information security than virtually all SMBs. Manufacturers that have the very highest uptime requirements can use a system that fails over to a network connection, Castellina said. At least one cloud ERP vendor sells an appliance that is installed on premises to buffer transactions between the factory and the cloud. By the summer of 2014, electrical manufacturer Scott Fetzer Electrical Group's (SFEG) ERP system was on its last legs. A unit of giant conglomerate Berkshire Hathaway, SFEG produces electrical products, including motors used in everyday items such as blenders. SFEG needed to modernize its operations to support an effort to promote business automation through the use of robotics. In use for 25 years, the existing ERP system was a legacy application, to put it mildly. Rather than seeking to update its on-premises system, SFEG opted for instant modernization in the form of cloud ERP software from Kenandy, based on the Force.com platform. "We just didn't have good enough visibility into our data," said Matt Bush, director of operations for SFEG in Fairview, Tenn. "We had accounting-created reports that would come out once a day to give a pulse on what was happening. But we needed real-time insight." In addition to gaining access to real-time financial, production and shipping metrics, now employees can access the system via smartphone wherever they are located -- a major improvement over the previous system. "Our ultimate dream was to run the factory from the beach in Cancun," Bush said. Now, SFEG executives have immediate insight into what they can and cannot ship at any given moment. Orders are not released to production until all the parts are in place, resulting in fewer delayed orders and a much better experience for customers. Bush appreciates the quarterly software updates that proceed without much fanfare. His team has customized the interface to emphasize fields that are important to them, such as enabling multiple pick operations for shipping. This customization was accomplished easily and without any need for programming -- an advantage of the embedded Force.com platform, Bush said. SFEG invested $100,000 in the Kenandy cloud ERP software, which Bush believes is "an order of magnitude" less costly than a new on-premises installation would have been. Although a few advanced capabilities -- including personnel and machine capacity planning -- are missing, they are coming soon. And the cost and maintenance advantages have been superb. "It's a no-brainer," Bush said. "This is ideal for a small to midsize company."